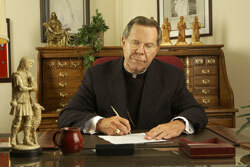 Archbishop-Emeritus Buechlein wrote a weekly column titled "Seeking the Face of the Lord." For nearly 20 years, it has been published 50 times a year in the official archdiocesan newspaper, The Criterion. You can read his columns online, or even listen to him read them to you. With the retirement of Archbishop Buechlein on September 21, 2011, this column will no longer be published starting in October.